You asked for it… We’ve got it! 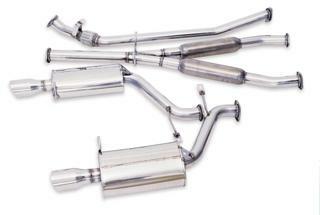 For many years you have requested a better exhaust system for Audi, VW, Acura and Honda. Well, NEUSPEED has been listening and now offers the ultimate stainless steel cat-back system so many of you have asked for. You get increased horsepower and torque for a strong, smooth pull throughout the powerband. Made of aerospace quality T-304 stainless steel, this system has perfect resonance. NEUSPEED’s state-of-the-art technology manufacturing creates maximum flow through the entire system, with the help of smooth mandrel bends throughout. Legal in all 50 states, the NEUSPEED stainless cat-back system will complement every aspect of your car’s performance, handling and overall driveability. Your car will be further enhanced with the mirror-like polished muffler and tips. Flanged joints allow for easy installation and perfect alignment, and a limited two year warranty for the original purchaser rounds out the package.